When Allies fall Out… | The British in Crete, 1896 to 1913. An affray occurred last evening between parties of French and Italian soldiers, in which two men were seriously wounded on each side. In the course of the night one of the Frenchmen died and one of the Italians. Two other less serious collisions occurred in which a third Italian soldier was injured. Owing to the cordial co-operation of the officers and the Consuls-General of the two nationalities order was promptly restored, and the Italian and French troops are now confined to their respective quarters. Funeral of an Italian soldier killed in a fight (brawl) in Canea. Date unknown. 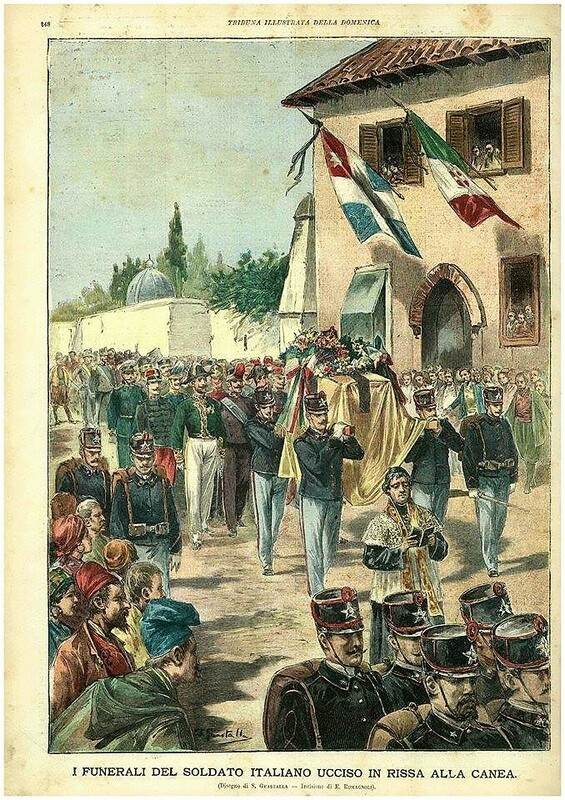 The illustration shows the funeral of an Italian soldier in Canea. While there is no date on the illustration, the flag of the Κριτικη Πολιτεια flying alongside the Italian flag indicates that the funeral took place after late December 1898. The caption states that the soldier being buried was killed in either a brawl or a fight, depending on the translation service used, in Canea. There’s nothing in the caption to indicate that he was killed as a result of any Cretan activity. All in all, this would suggest the illustration is of the funeral of the soldier killed in the brawl in 1899. Morning Post Monday 17 July 1899, p.5. London Standard Thursday 14 May 1903, p.5. London Standard Thursday 18 January 1906, p.9. Morning Post. Monday 29 January 1906, p.9. This entry was posted in European Intervention Crete and tagged Crete 1899, Crete 1903, Crete 1906, European Intervention Crete, French troops Crete, Italian troops Crete 1899, Italian troops Crete 1906 on January 30, 2019 by Mick McT.